The Illinois Department of Transportation warned that it will be unable to pay for road work underway if state lawmakers don’t soon finish a budget. Gov. Bruce Rauner called a special legislative session June 15 to bring together the House and Senate in hopes of passing a budget plan before a June 30 deadline. The outcome of the 10-day special session will have a major effect on DOT construction projects and has the potential to bring crews to a standstill if the Legislature does not reach a solution, according to a statement released by the DOT. “Due to the General Assembly’s refusal to pass a balanced budget, the Illinois Department of Transportation loses its ability to pay contractors starting July 1. While we are hopeful the situation is resolved before then, the department is notifying contractors that all construction work is to shut down on June 30,” Guy Tridgell, IDOT director of communications, said in a statement released to the public. 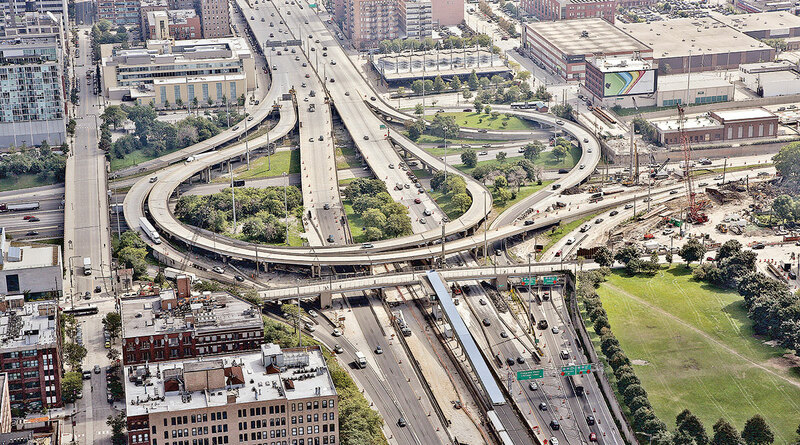 The Jane Byrne Interchange, Interstate 290 and I-90/94, running through Chicago, has been under construction since 2014 and isn’t scheduled to be finished until 2019. The potential to halt work on a vital route for trucks means continued headaches for the trucking industry — but it’s not a complete disaster, said Bob Ginsburg, a research assistant professor at the Urban Transportation Center at the University of Illinois at Chicago. “I think, from a trucking industry view, this is just a delay of improvements, such as removing the bottlenecks,” he said. IDOT has more than 20 construction projects in progress along truck-friendly routes, which are labeled as Class 1 roads. Unfortunately, looming shutdowns are nothing new to Illinois, Ginsburg said. Rather, he sees a recurring pattern. “The issue is ‘if’ there is going to be a shutdown. This is the third year in a row that, come the end of the fiscal year, they’ve stopped contracting for the DOT,” he said. The budget crisis last year was averted at the end of June, when a last-minute stopgap budget passed. The potential of pushing out project schedules will mean consequences, Ginsburg said: The state will bear those consequences, if not this year, in the coming years as projects drag on. Matt Hart, executive director of the Illinois Trucking Association, sees danger in the potential closure of IDOT construction. “Every week the construction is stopped is another week further away from completion,” he said. Hart and his association are heavily invested in the special session’s success, he noted. “We will continue to push and push [legislators] on the behalf of truck companies,” Hart said. According to state data compiled by the American Transportation Research Institute, the trucking industry in 2014 paid 46% of all taxes owed by Illinois motorists. In 2016, “a typical 5-axle tractor-semitrailer combination paid $9,082 in state highway user fees and taxes” in the state, ATRI said. Hart finds it frustrating that the trucking industry is pouring such a significant amount of money into the roads, yet he sees them in disarray as improvements sit on the cusp of closure. According to IDOT, “Contractors will be advised to secure work zones to ensure their safety during any potential shutdown. As always, the safety of the traveling public will be the top priority as the department works through this process.” The shutdown process will cost IDOT anywhere from $20 million to $50 million, Ginsburg said.